I admit that my daughter is spoiled. She is doted on by many relatives and we end up with an insane amount of gifts… which means there is a TON of wrapping, packaging (why is toy packaging so ridiculously wasteful??? ), and usually we’ll need to break out some batteries for electronic toys. With my husband being a geek, there are usually some kind of electronics involved as gifts too – so what to do with all the old electronic stuff? 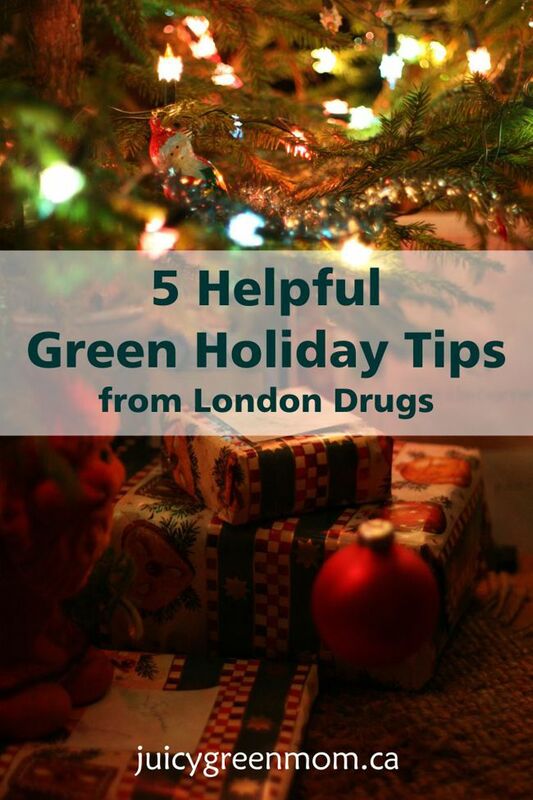 London Drugs has some great green holiday tips for addressing all of these issues – so you know what to do about them this holiday season! Now people can actually recycle their packaging where they bought it. London Drugs has a comprehensive Bring Back the Pack recycling program that provides an opportunity for all packaging from London Drugs products to be properly recycled. This answers the question of what to do with the Styrofoam surrounding your brand new TV or the cardboard and plastic wrap around your new kitchen toy. London Drugs has been actively recycling Styrofoam since 2008 and has diverted over 250,000lbs of it from landfills. How awesome is that?? 2. Recycle your old electronics & small appliances. Bring in the old electronics and appliances that were replaced over the holidays for proper recycling. Besides electronics like TV’s, computers and video players, customers can also recycle any small appliance with a plug at their nearest London Drugs. This includes toasters, microwaves, kettles, hair dryers, curling irons, televisions, alarm clocks and even cordless phones. Did you receive an electronic game or toy? Consider using rechargeable batteries to extend your play, reduce waste and save money in the long run. Popular sizes are all available with compact chargers and provide a great value for those toys designed to entertain your children, big and small, for hours on end. And remember, you can bring in your old batteries for recycling to any London Drugs. For more information on Rechargeable vs Regular Batteries visit the London Drugs Green Deal blog. 4. Recycle your broken Christmas lights. A string of broken lights is not trash. It contains copper wire and other elements that are worth recycling. Old lights can be taken back to your local London Drugs store. Look for energy-efficient LED lights to replace them. They last so much longer and will be easier on electricity bill too! 5. Donate your old cell phones and smartphones. Instead of discarding your old cell phones and smartphones; drop them off at London Drugs for proper recycling in a Call2Recycle collection box. By working with several key vendors throughout the year London Drugs continues to achieve a 90% plus waste reduction rate in all of its stores across Western Canada. For more information on recycling at London Drugs visit their Green Deal website. What green holiday tips will you use this year? Kudos to London Drugs and I hope other stores will follow suit.